Few were aware of Taiwan until 1949, when the victorious Communists on mainland China pushed the Nationalist Government of China across the Strait to Taiwan. Chiang Kai-shek, the well-known Kuomintang (KMT) leader, led nearly two million civilians and military personnel there. For nearly four decades until the liberalization beginning 1987, the government of Taiwan remained a semidictatorship, governing the people under a martial law and the Emergency Decree. It denied them most freedoms including the freedom of expression, to write and read what they liked. Beginning in 1949, the Taiwanese—or The Republic of China (ROC), as it calls itself—helped bring about economic prosperity and greatly improved the education system, but in an environment that often suppresses individual freedoms. However, between 1987 and 1992, restrictions were gradually lifted, and in 1996 and 2000, free and direct elections were held at all levels, including president. The new-found freedom also manifested itself in the nation's press, its media, and in the widespread use of the Internet. Taiwan was settled by Malayo-Polynesians before Chinese settlers from the mainland began arriving there in the twelfth century A.D. Classified as Aborigines, the descendants of the Malayo-Polynesians numbered about 414,000 in June 2000. More than 70 percent of them are Christian, while the Chinese are predominantly Buddhist or Taoist. The Constitution of Taiwan was amended in 1991 and 1997 to upgrade the status of the Aborigines and protect their civil and political rights. The ROC allocates funds and operates a host of social welfare programs to facilitate the assimilation of the Aborigines into the dominant community. At the same time, to preserve their ethnic identity, the Ministry of Education has introduced some Aborigine-language classes in primary schools and funded special programs at the university level to preserve their culture, history, and language. In order to promote their economic development, the state subsidizes Aborigines' university education and requires that government contracts involving at least 100 employees must include at least 2 percent Aborigines or persons with disabilities. The Chinese came to the island in large numbers in the seventeenth century, principally from Fujian and Guangdong. Among the Europeans, the Portuguese were the first to arrive in the sixteenth century. They named the island Ilha Formosa (beautiful island), which is how it was known in the West until well into the twentieth century. In 1622, the Dutch East Indies Company established a military base on the Pescadores Islands. In the following year, when pressured by the Chinese, the Dutch moved to the main island of Formosa and ruled it for the next 38 years. During that period, Taiwan became a transshipment center for goods from Japan, China, Java, and the Netherlands. Most of this sector's trade was very profitable to the Dutch Company, accounting for 26 percent of the Company's worldwide profits in 1649. It was during the Dutch rule that a large-scale immigration of Chinese from the mainland took place because of the Manchu invasion of China and the subsequent disruptions, particularly in the coastal and southern regions. An estimated 100,000 people from Fujian and Guangdong migrated across the Taiwan Strait between 1624 and 1644, by which time the Ch'ing (Manchu) dynasty had replaced the Ming dynasty on the mainland. Among those Ming loyalists who fled southward—where they opposed the Manchu's for 20 years—was Cheng Ch'engkung, who was known as Koxinga. Using Taiwan as his base, Koxinga attempted to restore the Ming dynasty; he expelled the Dutch in 1662 and established his own capital at Anping (the present-day Tainan). Koxinga's son and grandson ruled Taiwan for 20 years until, in 1683, the Ch'ing rulers of mainland China took over. In 1858, following the Treaty of Tianjan, four Taiwanese ports were forcibly opened for Western trade. A quarter century later in 1895, a militarily strong Japan invaded and annexed Taiwan. During their 50-year rule, the Japanese developed the island, first for agricultural products, then as a market for Japanese manufacturers. After World War I, Japan attempted to transform Taiwan into a stepping stone to launch its southward aggression. It also forced Japanese education and cultural assimilation on the local population. This included adopting Japanese names and a Japanese style of dress, eating Japanese cuisine, and observing Japanese religious rites. During the period, Japan built some 2,500 miles of highway, 2,857 miles of railroad, and modernized the ports. Following World War II, the Japanese were forced to return the island to China in 1945. The Taiwanese Chinese, acculturated under the Japanese rule, did not like their new Chinese leaders, who worked for China's Nationalist government. Uprisings against Nationalist rule brought a swift and brutal reaction. In 1949, after the Chinese Communists forced nearly two million followers of Chaing Kai-shek to to flee the mainland to Taiwan, the Taiwanese Chinese surrendered. With the outbreak of the Korean War, the United States ordered its Seventh Fleet to protect the ROC against possible attacks by the mainland People's Republic of China (PRC). The United States also provided the ROC with considerable economic and military assistance. The close relationship between the United States and the Republic of China suffered the first in a series of major setbacks when the ROC lost its membership in the United Nations, including the Security Council, on October 25, 1971. Then came President Nixon's visit to the PRC in February 1972, which upset ROC leaders. On January 1, 1979, the United States formally recognized the PRC and severed its ties with the ROC; the termination of the Mutual Defense Treaty between the United States and Taiwan followed at the end of the year. Despite all these events, the U.S.-ROC relationship has remained close, thanks to continued military and economic ties. The United States established even closer ties to the PRC after the latter liberalized its economy beginning in 1979. At the same time, it occasionally warned the PRC against any military aggression toward Taiwan. Until 1987, Taiwan was ruled under martial law, proclaimed by the ruling KMT, which held a monopoly over political and military power and did not permit any other political party to function. In 1987, President Chiang Ching-kuo ended the martial law by lifting the Emergency Decree and allowed individual freedoms, including the establishment of political parties. Nongovernmental civilian contacts between Taiwan and mainland China were allowed. Economic prosperity and widespread education in Taiwan had led to an insistent demand for political liberalization. Within a decade, Taiwan boasted 84 political parties, of which three claimed to be national parties: the Democratic Progressive Party (DPP), the New Party (NP) and the KMT. Paralleling the process was the sure transition from authoritarian to a democratic rule. Gradually, the ROC reconciled to holding authority only over Taiwan and the surrounding islands, giving up its claim to the mainland. Beijing, however, continued to regard Taiwan as a renegade province, allowing, however, exchanges with it in the fields of trade, tourism and culture. In the 1950s, in the wake of the KMT's occupation of the island, there was not much industrial growth; most of Taiwan was agricultural, and residents had very little purchasing power. The government restricted the size of newspapers to only 8 pages, ostensibly as an economic measure but in reality to restrict freedom of expression. 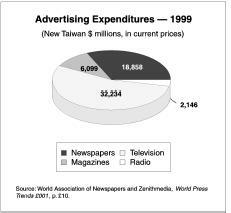 Despite the increased industrialization of Taiwan, the newspaper industry lagged behind; by the mid-1980s, the size of newspapers was allowed to expand only up to 12 pages. Times was launched and experienced great success in a very short time. The Asian Wall Street Journal and The International Herald Tribune issue Taiwanese editions. While these are prized by the foreign population, the Taiwanese readers of the English-language papers patronize them both for the local news and for the excellent learning tools they provide for students of the English language. Almost all the main newspapers come out of the capital city of Taipei. They have correspondents in the main towns and cities on the island, as well as in many important countries. Their news coverage is professional and in-depth, and they specialize in several different areas. Among the dailies with regional interest, those based in Kaohsiung have established an identity with people in the southern region by emphasizing the news of the region as well as local culture and cuisine, literature and history, sports, and business. Among them are the Commons Daily, the Taiwan Times and the Taiwan Shin Wen Daily News, which are also known for wider usage of expressions peculiar to the Taiwanese dialect. There has been a phenomenal growth of nonpolitical magazines in Taiwan. On the other hand, the political magazines have suffered because of the Internet and cable television. The Global Views Monthly and the China Times Weekly have managed to hold their subscriptions at a profitable level. The weeklies and biweeklies have declined, giving way to monthlies, bimonthlies, and quarterlies. Many of the new magazines such as TVBS Weekly,Cashbox, and Tanhsing are aimed at the younger audience between the ages of 15 and 24. The Reader's Digest, which translates the original English stories into Chinese and supplements the offerings with original Chinese-language articles of general interest. The new magazines that have experienced success are in the areas of finance and management, computer science and technology, women's issues, and health. Thus, PC Home, started in February 1996, has registered a spectacular growth. Others in the field are: The Third Wave, published by the Acer Group; PC Magazine; and Amazing Computer Entertainment, which is a Chinese-language affiliate of the U.S. magazine PC Gamer that carries a free CD-ROM in every to introduce new computer games to its younger readership. Evergreen, Common Health, and Health World, all in Chinese, as well as the Chinese editions of Harper's Bazaar,Cosmopolitan, and Vogue, dominate the health and fitness magazines. An older yet still very popular magazine is the Chinese-language Commonwealth (started in 1981), which has an attractive layout and graphics, well-written financial stories, and more recently, excellent articles on macroeconomic trends and modern management concepts. It has a wide readership among Chinese communities in Southeast Asia and throughout the entire Chinese world through the Internet. Another magazine, Wealth, is regarded a "must read" both by politicians and business leaders because of its perceptive articles—despite the fact that it looks more like a thick paperback than a magazine. During the decades following the KMT takeover of Taiwan in 1949 and more particularly after 1962, the economy witnessed an exponential growth at an annual rate averaging nearly 10 percent between 1962 and 1985. The island was transformed from a reliance on agricultural exports in the 1960s and 1970s to high technology and chemical products in the 1980s and 1990s. By 2000, technology-intensive products comprised more than 50 percent of all exports. With the lifting of the Emergency Decree in 1987 and the subsequent contacts between the people of Taiwan and mainland China, the Taiwanese business community began investing on the mainland. By 1998, such investments exceeded US$13 billion. Exports to China increased phenomenally in the 1990s, reducing Taiwan's dependence on the U.S. market but increasing concerns over its dependence on the mainland market. The Taiwanese government acknowledges that much of its economic progress is due to the rapid expansion of and improvements in education. Illiteracy on the island dropped from 34.6 percent for those six years and older in 1951, to 15.3 in 1969, to less than 6 percent in 2000, with much of that gain coming in the elderly population. The number of high school students increased from about 34,000 in the early 1950s to more than 400,000 in the 1990s. In the four decades since 1950, the number of university students increased ninety-fold. By 1997, there were 48,619 students in the nation's 766 graduate programs with 10,013 students pursuing doctoral programs. Thousands of additional graduate students were enrolled in universities in the United States, Canada, Australia, and Western Europe. The exponential increase in education had a direct effect on the number of publications on the island—newspapers, magazines, and books all increased—and since the mid-1990s, it has also led to a large number of Internet users. Many prominent Taiwanese newspapers and magazines are owned by three important chains. The China Times belongs to the same chain that publishes the Commercial Times, the China Times Express, the China Times Weekly, the Taiwan edition of the French magazine Marie Claire, and Art China. In September 1995, the China Times Web site began making news available through the Internet to Chinese readers all over the world. The United Daily News be-longs to the same chain that publishes Economic Daily News,Min Sheng Daily,United Evening News,Star, the literary monthly Unitas, and Historical Monthly. It also publishes the World Journal in New York, the Europe Journal in Paris and the Universal Daily News in Bangkok. The third major newspaper publishing house publishes The Taipei Times in English and the Liberty Times in Taiwan and a U.S. edition in Los Angeles. The adverse economic situation has affected newspapers in general and even more so those owned by the government, the armed forces, and the major political parties. Journalists and allied newspaper staff have suffered considerably, with hundreds receiving severance packages or salary cuts. The constitution of the ROC, drawn up in 1947, applied to Taiwan and mainland China, as Taiwanese leaders in the past always assumed the two nations would one day become one again. In 1987, the ROC finally realized that a reconciliation was unlikely and resigned itself to being the government of just Taiwan and the neighboring islands of Matsu, Quemoy, and Pescadores. The constitution provides for five yuans, or governing bodies: legislative, executive, judicial, control, and examination, with the executive being responsible to the legislature. Beginning in 1950, the people directly elected all representative bodies below the provincial level. In 1951, sixteen county and five city governments and councils were established. In 1959, the first Taiwanese provincial assembly was established, marking the participation of the people in the political process from the county to the provincial level. Full democratization of Taiwan's politics began after Chiang Ching-kuo, the son of Chiang Kai-shek, was elected President in 1978. (Chiang Kai-shek died in 1975 and was succeeded by Yen Chia-kan for three years.) In 1986, the first major opposition party, the Democratic Progressive Party (DPP) was formally recognized. The most important measure occurred in the following year when the President announced the end of martial law and the Emergency Decree. Although Chiang Ching-kuo died in 1988, his successor, President Lee Teng-hui, continued with the reforms, allowing trade unions, legalizing strikes and demonstrations, and removing restrictions on newspapers. His government guaranteed the freedom of the press. The result was an explosion of growth of newspapers and electronic media in Taiwan on an unprecedented scale. The constitutional amendments of 1997 provide the legislative yuan with the authority to dismiss the Cabinet with a no-confidence vote. The judicial yuan was made constitutionally independent of the other branches of the political system. By and large, the government respects the independence of the judiciary. In 1991 and 1992, the first elections to the National Assembly and the legislative yuan were held. A constitutional amendment in 1992 transformed the control yuan into a semijudicial body. On March 23, 1996, the first direct election of the president or head of state was held. Four years later, on March 18, 2000, the second direct presidential election took place, bringing the DPP to power with Chen Shuibian as president. The multiparty elections held at various levels promoted discussion and often boisterous debates, with the press and the media promoting them and in the process registering the largest number of readers and viewers. There is no official censorship in Taiwan. After the martial law and the Emergency Decree were ended in 1987, the free atmosphere needed for the healthy functioning of the press and the media returned. Multiple political parties were allowed, yet the KMT party remained dominant at the national level until 2000, when the opposition Democratic Progressive Party replaced it. The DPP took measures to safeguard the constitutionally sanctioned civil rights of Taiwan's citizens. A major setback to such a movement came immediately after Chen's inauguration on May 20, 2000, with the shocking news that a military court had sentenced Major Liu Chih-chung to nine years in prison for allegedly leaking military secrets to the press. The news rocked Taiwan, and the case attained tremendous sensitivity because the secrets involved Taiwan's security in relation to mainland China, which has for the last half a century regarded Taiwan as a "renegade province" and desired its integration. In fact, Liu's disclosure that three warships from mainland China had entered the Taiwan Strait was more an embarrassment to the defense establishment than an actual security threat to the country. The sentence was condemned by several legislators, prompting the newly elected President Chen to appeal to a gathering of journalists to exercise a balance between the needs of reporting and remaining "alert to disasters, risks and Beijing's hostility." In November 2000, almost six months after the DPP attained power, a new policy was instituted allowing mainland journalists to be based on the island. The first two correspondents arrived on February 8, 2002. The bonhomie between the mainland press and Taiwan did not last long; reticence set in soon with Taipei's allegations that the official mainland news agency, Xinhua, had published "incorrect reports" about Taiwanese politics. Beijing, in turn, complained that its journalists were allowed only month-long visits and that Taipei had refused to renew their permits under "false pretexts." Under the new dispensation (as the New York-based Committee to Protect the Journalists (CPJ) highlighted in its 2001 report), Taiwan's press has remained independent and lively, providing a bedrock for Taiwan's democratic society; of course, debates over just how much freedom the press should have still continue. In January, 2001, Vice-President Annette Lu filed a lawsuit against a popular weekly news magazine, The Journalist. The latter had reported that Lu had telephoned the magazine's editor disclosing President Chen's romantic involvement with an aide. Lu denied the telephone call and demanded an apology from the editor. Instead of suing the magazine and invoking Taiwan's legal provisions for criminal penalties for libel, defamation, and insult, Lu opted to pursue the case as a civil matter. On March 20, 2002, the public prosecutor's office of the Taiwan High Court raided the offices and printing facilities of Taiwan Next magazine on grounds that it had endangered the nation's security by leaking state secrets. The raid occurred after 20,000 issues (out of a total print run of 180,000) of the March 21 issue of the magazine had already entered the distribution chain, notably the capital's convenience stores. The weekly magazine tabloid owned by Hong Kong media tycoon Jimmy Lai was been known for its risqué coverage of scandals involving celebrities and politicians. It had, in the past, attracted attacks by baseball bat-wielding thugs in August 2001.This time it had committed a double sin—venturing into the forbidden territory of state security and implying political corruption. Taiwan Next was not the only one to question corruption in the state security apparatus. Both China Times and Next magazine reported that during the KMT's Tenghui administration, the National Security Bureau (NSB) had funded espionage through two secret bank accounts worth about US$100 million that were used to pay spies in mainland China and middlemen who would help in getting various countries to maintain diplomatic relations with Taiwan. The magazine's editor, Pei Wei, defended his action on grounds that "the two secret funds have nothing to do with national secrets, so the search is a violation of press freedom." The entire operation was beyond legislative oversight. The government's reaction was twofold: to tighten the agencies against future leaks and to devise ways by which the intelligence agencies could be brought under better legislative supervision. Human rights activists condemned the prosecutor's action, alleging a gross violation of Article 19 of the United Nations International Human Rights Declaration, which states that "every individual has the right to say what he or she wants to say, as well as to communicate with others by whatever media he or she chooses." They pointed out that while President Chen had promised to sign the Declaration, his Minister of Justice, Chen Dingnan, "totally broke that Declaration." Broadcasting in the first decade of the KMT rule in Taiwan in the 1950s focused on family entertainment and covered mostly cultural, educational, and children's programs. The next decade witnessed the arrival of television, which revolutionized viewer demands. The 1980s saw big changes in the radio market, as many stations began targeting special audiences interested in news, light music, traffic news, the stock market and finance, or agriculture and weather. Since the 1990s, public interest has focused on radio call-in programs, where the listeners get to express their views on national and international issues, or to question government officials on diverse policies that affect the public. The regular broadcasting in Taiwan includes medium-wave AM and VHF FM stations, medium-and short-wave broadcasts to mainland China, and some specialized programming using short-wave to transmit to Chinese communities in other countries. The national broadcasting is governed by the Central Broadcasting System Establishment Statute of January 1998, which established the present Central Broadcasting System (CBS). The predecessor of the CBS was the Broadcasting Corporation of China (BCC), founded in 1947. Historians point out that the parent of the BCC was the venerable Central Broadcasting Station, founded in Nanking in 1928. After the advent of the KMT in Taiwan, the BCC had begun transmitting as the Voice of Free China over short-wave channels. The BCC started the first FM station in Taiwan in 1968, and stereo broadcasts over AM channels in 1987. The CBS operates a variety network and a news network in Mandarin Chinese and a dialect network that transmits in seven dialects, including Southern Fujianese, Cantonese, Hakka, Mongolian, and Tibetan. The Radio Taipei International broadcasts in 11 foreign languages, and its Voice of Asia broadcasts in English, Mandarin, Thai, and Bahasa Indonesia. Being the national station, the CBS is used for publicizing the government's policies affecting business and taxation, education and culture, and domestic and foreign politics. The government-run Public Radio System (PRS) operates three networks: a national traffic network giving traffic conditions on the nation's highways and freeways, a regional traffic network, and a local traffic network comprising five FM and two AM stations; it also covers weather conditions across the island nation. The PRS also has an "evergreen network" covering health and medicine, travel and leisure, and government policies toward social services for the senior citizens, women, and children. The Voice of Han Broadcasting Station operates six stations in Taipei and fifteen transmission sites around Taiwan. It uses its AM and FM channels in Taiwan and has regular broadcasting beamed at mainland China. The UFO Network, established in 1996, suddenly became popular with its seven FM frequencies. Two years later, its broadcasts were known overseas, notably in the United States, Australia, and New Zealand. It allocates 30 percent of its time to news, 50 percent to music, and 20 percent to variety, catering to all age groups and all professions. News98 is an FM station, the only station broadcasting news around the clock with updates every quarter of the hour. The news covers domestic and international politics; finance, medicine, and health; and literary developments. Finally, there is the International Community Radio Taipei (ICRT), which is owned by the International Community Cultural Foundation. It is the most important all-English radio station and is indispensable for the international community in Taiwan and for those who like Western music, English-language talk shows, and international news. ICRT is also available on Internet audio. Radio broadcasting showed spectacular growth between February 1993 and October 2000 when the government released ten batches of frequencies, enabling the rise in radio broadcasting companies from 33 in 1993 to 137 in September 2000. The ninth batch of frequencies released in May 1999 included 42 frequencies for regional stations and 30 for community stations that cater to the needs of various ethnic groups in the island's different regions. Public television has undergone a major reorganization since July 1, 1998, with the establishment of the Public Television Service (PTS) under the provisions of the Public Television law of May 1997. The PTS is an independent, nonprofit station whose aim is "to serve the interests of the public, raise the standards of Taiwan's broadcast culture, safeguard the public's freedom of expression and access to knowledge, and enhance national education and culture." Under the 1997 legislation, the PTS received a government subsidy of NT$1.2 billion (US$37.2 million), which will be reduced by 10 percent every year until it falls to half of the first year subsidy. Since its inception, the PTS has been able to raise its own funds through program sponsorship from business and industry, donations from individuals and corporations, sale of videotaped programs, and the leasing of its studios. The PTS has established an excellent reputation for the wide range and high standards of its programs, suitable for all age groups, minorities, and those with hearing impairment. Its repertoire includes music, dance, and theatrical performances; folk dances; and traditional local operas. Besides news and commentaries on current events, it has special programs on the environment and ecology, history and culture, social and economic change, domestic politics, and foreign policy. It also shows movies and children's programs. Its programming includes "in-house productions as well as culturally diverse international programs that promote cultural exchange" and expand the horizons of the Taiwanese people. The growth of commercial television has paralleled that of public television beginning in 1962. That same year the Taiwan Television Enterprise (TTV) was born, soon followed by China Television Company (CTV) in 1969 and Chinese Television System (CTS) in 1971. 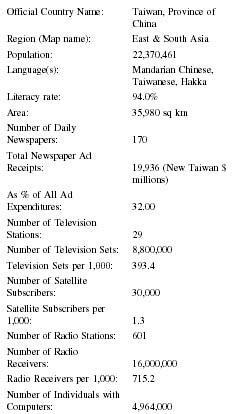 In the 1990s, television in Taiwan took giant strides with increased satellite broadcasting and digital television. The popular Formosa Television (FTV) affiliated with the Democratic Progressive Party was born in 1997 as a part of the liberalization of electronic media. Much like in the United States, Taiwan's over-theair broadcast television industry suffered greatly at the end of the 1990s at the hands of the cable television industry, which cut into its number of viewers and advertising revenues. Until August 1993, when the Cable Television Law was passed, the illegal cable systems were taking some advertising away from broadcast television, but it would have to be regarded as totally insignificant compared to the substantial and unacceptable losses since the mid-1990s. Cable television is preferred because of the quality of reception in the hilly areas and because of the wide selection of programming. Taiwan is also involved in the construction of its ADSL (Asymmetrical Digital Subscriber Line) network, which will increase high-speed data communications for Internet access, video conferencing, and multimedia applications. Two of Taiwan's major cable TV facilities have been using high-speed (1.5 Mbps) broadband network services in 1999 through ADSL modems. According to Chunghwa Telecom, almost all of the country's 10 million-plus local telephone subscribers were on high-speed broadbands by 2000. By that time, all of Taiwan's 3,272 elementary and junior high schools were connected to TANet (Taiwan Academic Net) by broadband network, with the schools on the main island using the high-speed ADSL system and those on off-shore islands and in mountainous areas using the fiber optic or microwave systems. This level of sophistication placed Taiwan at number three in the world—after Sweden and Canada— for its Internet penetration rate in the schools, which stood at 63 percent in 2000. 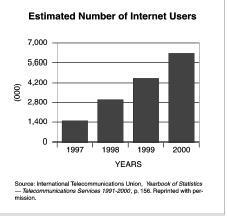 By mid-2000, Taiwan had 5.57 million active Internet users, a 16 percent increase over the figure for 1999. Its online penetration rate was 25 percent. Between December 1999 and June 2000, the number of cable and ADSL subscribers increased 200 percent and 170 percent, respectively. In January 2000, Taiwan ranked seventh in the world and second (after Japan) in Asia for the number of Internet hosts; its nearly 850,000 hosts was an increase of 25 percent over the July 1999 figure. Taiwan is a member of the Internet Corporation for Assigned Names and Numbers (ICANN), a nonprofit international organization established in November 1998 to oversee IP address allocation. Our resolve is unwavering as we work to disencumber our government infrastructure from the problems we have inherited from the past and to begin to fill the voids by building legal intelligence oversight mechanisms based on the principle of democracy. Such mechanisms include the legislation of our Government Classified Information Protection Act and Government Information Disclosure Act. The essence of democracy should never be quelled under the pretext of national security, nor should the flag of national security be used as a cover for undermining freedom of press. As a democratically elected president, it is my duty to listen carefully to what the media [have] to say. Therein lies a major change in the attitude of the Taiwan government, which may hold promise of continued freedom of the press and the healthy growth of all media in that country. APT (Asia-Pacific Telecommunity). The APT Yearbook. Bangkok and Surrey: APT & ICOM, 2000. Chen, J. C. Y. "Republic of China (Taiwan)." In Newspapers in Asia: Contemporary Trends and Problems, ed. J. A. Lent, 54-76. Hong Kong: Heinemann Asia, 1982. French, D. and M. Richards, eds. Contemporary Television: Eastern Perspectives. New Delhi: Sage, 1996. Gunaratne, S.A., ed. Handbook of the Media in Asia. New Delhi: Sage, 2000. Hsu, C. S. "Republic of China (Taiwan)." In Broadcasting in Asia and the Pacific: A Continental Survey of Radio and Television, ed. J.A. Lent, 12-21. Philadelphia: Temple University Press, 1978. Kennedy, Brian. "Take Care of Taiwan's Freedom of the Press." Taipei Times (March 5, 2001). Lay, Y. J., and J.C. Schweitzer. "Advertising in Taiwan Newspapers Since the Lifting of the Bans." Journalism Quarterly 67 (1990): 201-206. Lee, Chin-chuan. "State, Capital and Media." In De-Westernizing Media Studies, eds. James Curran and Myung-jin Park. London: Routledge, 2000. Liu, Y. I. Cable Television Management and Programming Strategies. Taipei: Cheng-chun Publishing, 1994. Lo, V. H., H. Wu, and A. Paddon. "Front Page Design of Taiwan Daily Newspapers, 1952-1996." 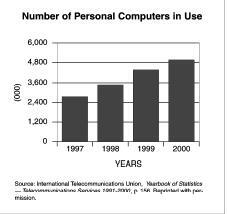 Mass Communication Research 59 (1999): 67-90. Lo, V. H., J.C. Cheng, and C.C. Lee. "Television News is Government News in Taiwan." Asian Journal of Communication, vol. 4, no. 1 (1994): 99-110. Pang, K. F. "Taiwan." In Walking the Tightrope: Press Freedom and Professional Standards in Asia, ed. A. Latif, 173-182. Singapore: AMIC, 1998. The Republic of China Yearbook 2000. Taipei: Government Information Office, 2001. Statistical Yearbook. Paris: UNESCO, 2000. Vanden Heuvel, J., and E.E. Dennis. The Unfolding Lotus: East Asia and Changing Media. New York: The Freedom Forum, 1993. Wei, R. "Press Developments in Taiwan and the Changing Coverage of the Taiwan-China Relationship." In Mass Media in Asia Pacific, ed. B. T. McIntyre, 67-71. Clevedon, PA: Multilingual Matters, 1999.